Soak up every last minute of the summer heat by spending the day in the water! 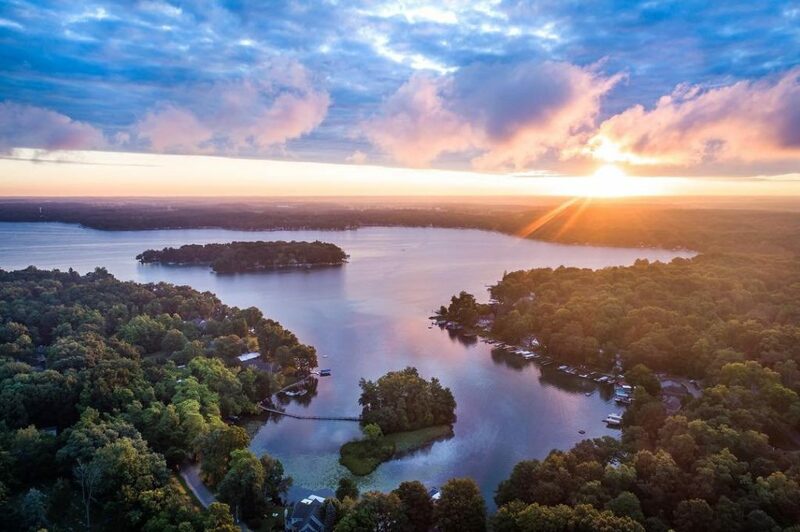 Fish, swim, water ski, sail or boat in one of Kalamazoo County’s 83 lakes with public access, or feel the sand in your toes along the majestic shores of Lake Michigan—just a 45-minute drive away. Consider these (269) lakes, both big and small, for your next water adventure! Public park, picnic area, swimming and boat launch to Gull Lake. Located between Galesburg and Climax, Cold Brook Park is home to a popular campground and beach. The park has 276 acres consisting primarily of water in the form of three lakes and unique wetlands. Cold Brook is also home to a championship disc golf course. Woods Lake is a 26-acre lake located northwest of Oakland Drive and Parkview Avenue. About 60% of the lake’s shoreline is owned by members of the Association, while the remaining shoreline is owned by the City of Kalamazoo and the Oakwood Neighborhood Association. Woods Lake Beach Park and Lake Park are open to the public. Jean Klock Park, dedicated in 1917, includes 76-acres of Lake Michiganfrontage and 3,000-feet of beach front, with open and wooded sand dunes. Lake Michigan swimming, paved parking, boardwalk, volleyball courts, observation tower, bathhouse, concession area, playground and picnic shelter. Overlooking Lake Michigan from a bluff in Benton Township, Rocky Gap County Park provides a wonderful place to enjoy the Lake Michigan shoreline. Rocky Gap County Park has 1,100 feet of Lake Michigan frontage. It is an ideal location to take a relaxed lunch break, cool off with a quick swim, and enjoy a sunset. The lower park provides easy access to the sandy beaches, and the upper park presents spectacular panoramic views from the Lake Michigan Overlook Deck. Located on the sunny shores of Lake Michigan. Swim or relax on our beautiful sandy beach and stop by our beach house for lunch or maybe just a snack. We offer: developed campsites, semi-developed campsites, boardwalks, camping, cabins, observation decks, hot showers, picnic areas, clean bathrooms, outdoor grills, dump station, play ground, large lots, and a concession stand. This expansive recreation area north of Kalamazoo features biking, horseback riding trails, fishing piers, beaches and nine lakes for fishing and lots of winter activities. Three special points of interest are: Devil’s Soupbowl, a glacially carved kettle formation, Graves Hill Overlook and The Pines. A 200-site modern family campground is open spring through fall.